Below are some scraps from an old jotter belonging to "Alex", with press cuttings from Radio Free Scotland. It is such a shame he never had any old manky tape recordings from these days. Radio Free Scotland was a name associated with the Scottish Nationalist Party. 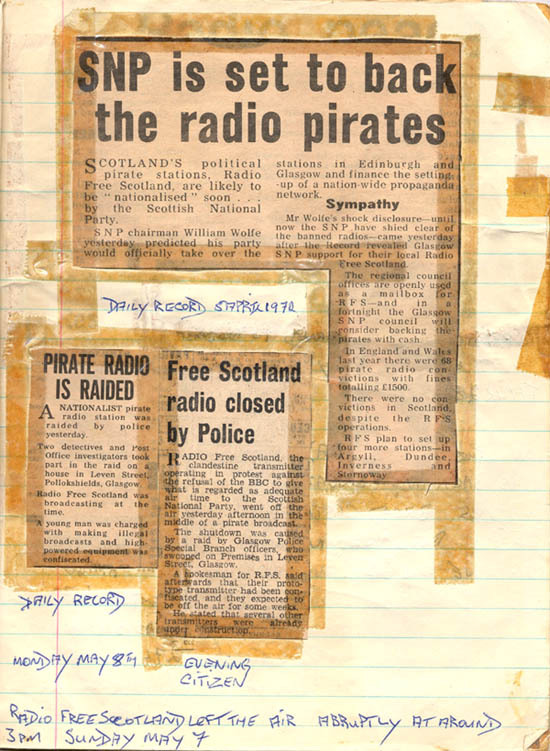 A web search these days will give Gordon Wilson's book on the station, a web site with cheap web hosting, and other interesting pages!! 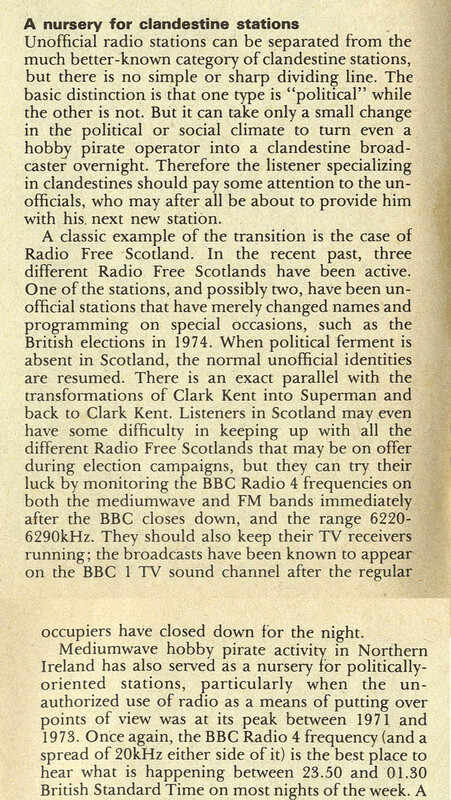 The station received coverage in the pages of the World Radio TV Handbook, 1976, as well as in the 1978 WRTH in an article by John Campbell, see below. 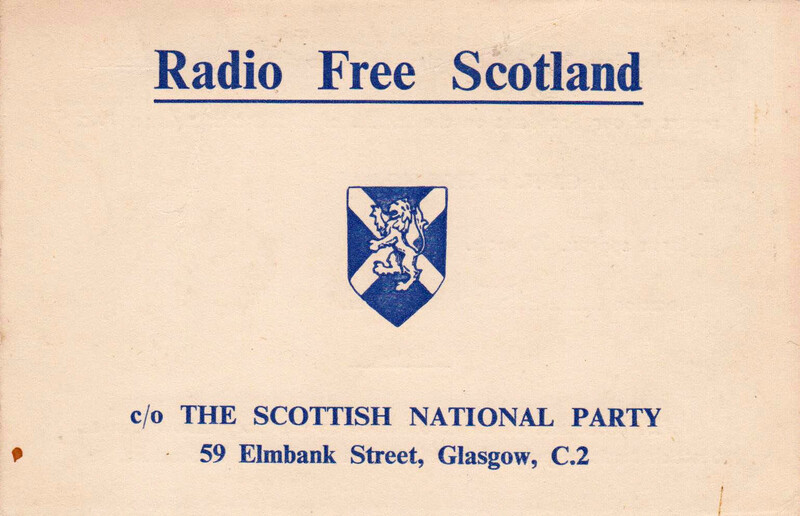 In October 2013 we bought an old Radio Free Scotland QSL card. It cost more than hoped, ie the fiver asked. We had to go to 25 quid!!! But it is in the archives now. A real national treasure. 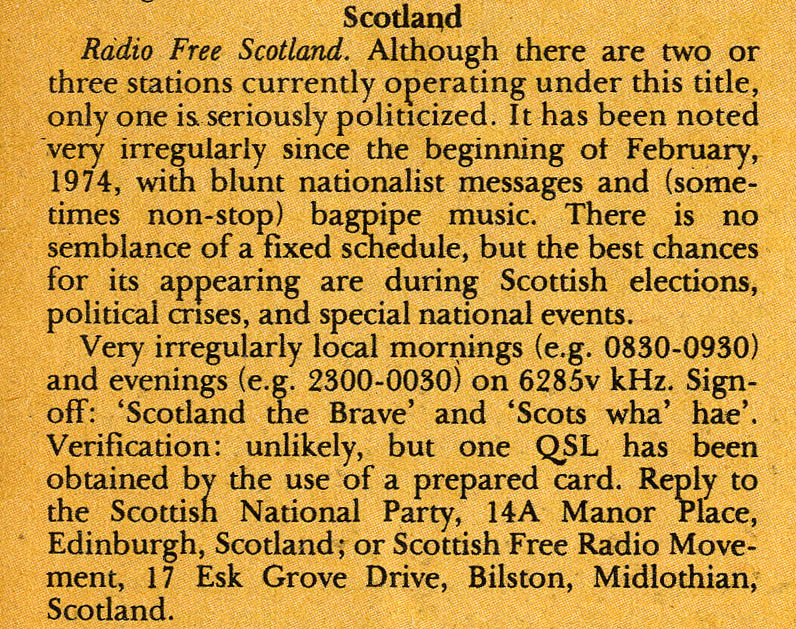 It is such a shame that it is not for SW Scotland area, where there was a service as well on the BBC sound channel, audio only. 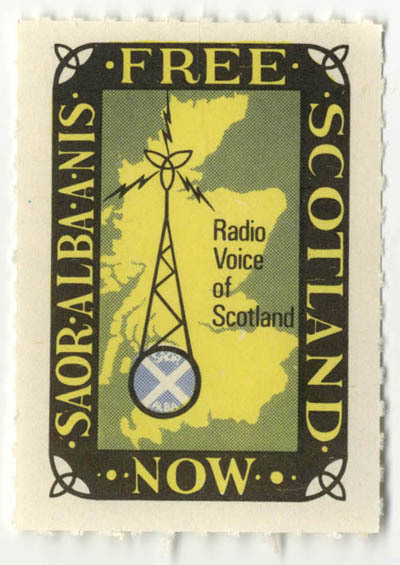 A STAMP FROM "RADIO VOICE OF SCOTLAND"
Only a few weeks after finding the Radio Free Scotland QSL, an unusual stamp was spotted in an auction. More a curiosity, but it is reproduced here, incase anyone else has seen a thing like this before, and maybe shed some light. Obviously this is not a postage stamp, but perhaps one of those extras that got stuck on envelopes. Much like the Christmas stamps, with pictures of Santa and snow etc that we used to stick on envelopes along with the real stamp for Christmas Cards. 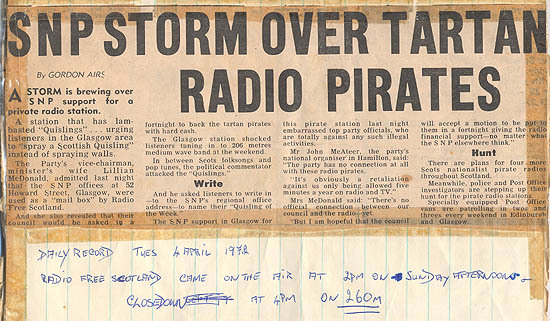 And the Radio Caroline stickers we used to stick on envelopes from FRS in Reading back in the day!! But the stamp of course may be from an 80's CB club or something. UPDATE: Thanks to Eddy, and also "The Plant Waterer..!!" 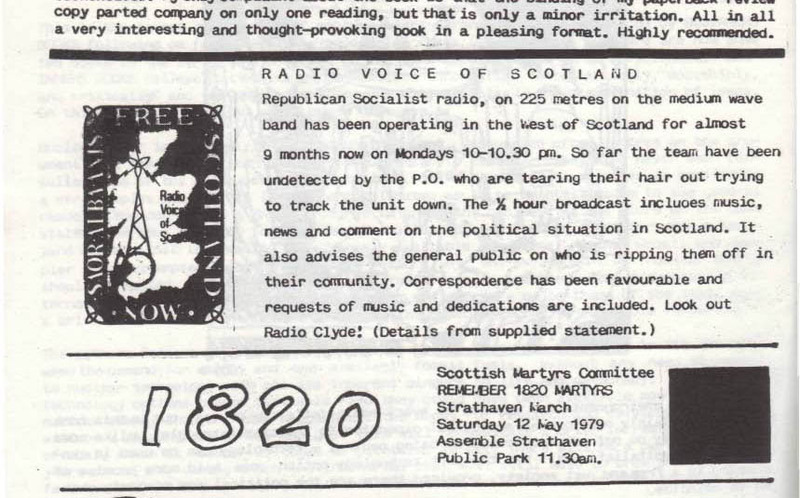 They have found an article in a Scottish Socialist magazine from 1979!! Well done on the find!! I never found this on my searches with Google. That; what happens when you use quotations. 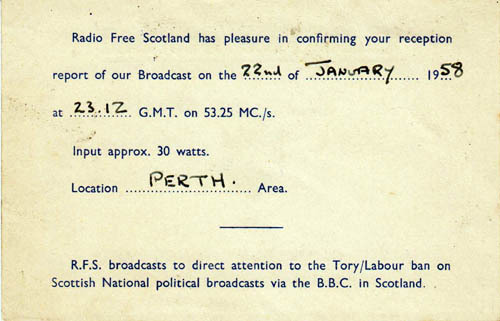 "Radio Voice of Scotland" !! So it is an interesting find, and an interesting curiosity after all!! A few pages are included in a pdf file as an example of what the magazine consisted of. 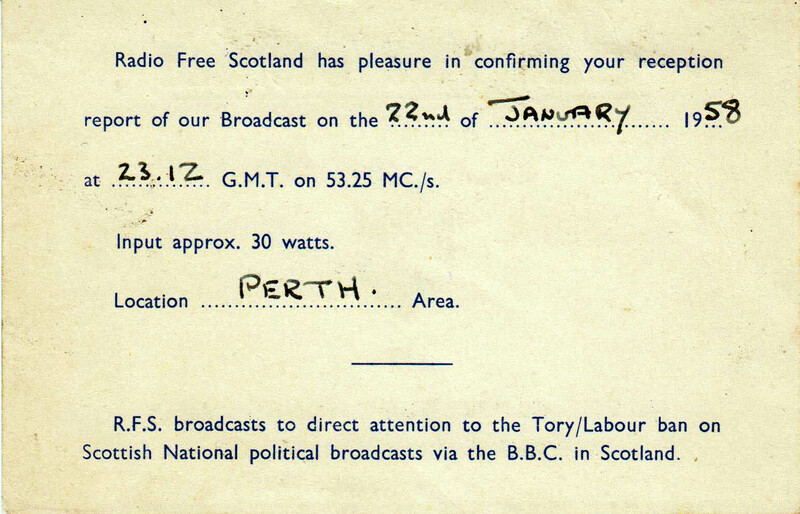 This would suggest that this is nothing really to do with the Radio Free Scotland of earlier years then???? Link to the site where the archive of the magazine can be found. And a direct link to the publication in question, which is split up into three parts.